California voters passed Proposition 47 in November 2014, to allow those convicted of certain types of low-level felonies California Penal Code to petition their original trial court to have their felony convictions reduced to misdemeanors. Under the provisions of Proposition 47, unless there are compelling reasons to the contrary, the court must grant the reduction. There is one fact that you must keep in mind if you are considering filing for a Proposition 47 reduction: your petition must be filed with your original trial court by November 4, 2017. After that date the courts are barred from accepting new Proposition 47 petitions, although petitions filed before that date will still be heard at the court’s discretion. Sealing, which is available only to those who were arrested but never formally charged, where the charge was later dismissed by a court, or were found not guilty at trial. Expungement, which applies only to those with nonviolent misdemeanor or felony convictions, were never sent to a prison, and have successfully completed all the terms and conditions of probation that were imposed for their original conviction. The procedure for requesting a sealing or an expungement of your criminal record can be complicated and there may be a time limit on such petitions. It is strongly suggested that you contact a California criminal defense lawyer if you are considering filing a petition for expungement or sealing of your record. Why is a misdemeanor conviction better than a felony? Many employers won’t hire convicted felons. If you fill out a job application after getting your sentence reduced, you won’t have to check off Yes on the question “Have you ever been convicted of a felony?” because the conviction would be reduced. Can I get a firearm after a Proposition 47 reduction to a misdemeanor? No. Felony restrictions on gun ownership do not change, even after a felony is reduced to a misdemeanor under this rule. The restriction on purchasing and owning a gun will remain. There are many types of serious charges that are ineligible for record changes under Proposition 47. A Proposition 47 reduction means that thousands of felony convictions will be reduced to misdemeanors, providing former felons with many opportunities that had been previously denied to them. Since this represents a chance for many new opportunities for offenders, it is strongly suggested that you obtain the services of a California criminal defense lawyer to manage your Proposition 47 petition for you. If you are currently serving a jail or prison sentence for a felony that qualifies for resentencing under Proposition 47, you can petition the trial court that originally sentenced you for resentencing. The proper forms for such petitions can usually be obtained at a jail or prison library. If these forms are unavailable, you can ask the prison librarian to obtain them for you. Once your petition is filed, the court will examine your previous criminal record, incarceration records, arguments from the prosecuting attorney in your case, and any other evidence that applies to your criminal history. Unless the court finds that resentencing you would pose a danger to public safety, it must reduce your felony conviction to a misdemeanor and resentence you accordingly. If you were convicted of a felony that qualifies for reduction to a misdemeanor and you have served your sentence, you can petition your original trial court to have your felony conviction reduced to a misdemeanor. As with petitions filed by prison and jail inmates, the court must grant your petition unless it finds that reducing your crime to a misdemeanor would not be in the public interest. 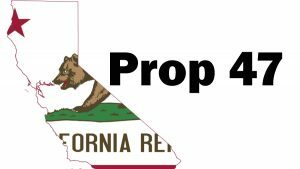 Again, the deadline for filing a Proposition 47 petition is November 4, 2017. Do not let this deadline pass if you are interested in a reduction of your felony charge!